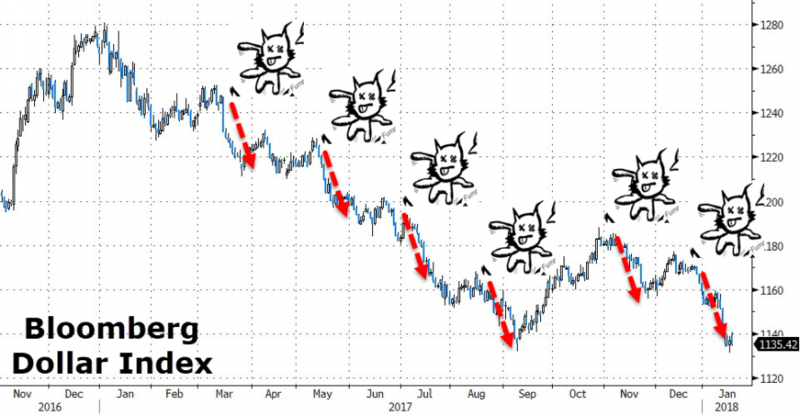 Trader Fears Dollar's Drop "Represents A Crisis Of Confidence About The Country"
The dollar index broke down to its weakest level since Dec 2014 yesterday. Despite Fed rate hikes and hawkish forward guidance, every bounce is sold as former fund manager Richard Breslow warns, for get all that, "This looks like the far more worrisome and potentially long-lasting effects of global reserves being consciously built up and allocated in a more widespread fashion." As a gross generalization, I think it’s fair to say that I tend to put a dollar positive spin on things. Which is kind of odd, since I’m sure I have made more money over the years being short rather than long. With the absolute exception of that great fun for dealers, not so much for anyone else, episode of the Asian financial crisis. My predilection may be an adolescent rebellion against my seniors who told me way back when that I’d never amount to anything nor enjoy the benefits of a Plaza Hotel lifestyle if I didn’t get it through my head that the dollar was going down. At the moment, the dollar looks just awful. Yet it remains very tempting to want to call the turn. After all, based on so many of the more obvious metrics it should be a buying opportunity. Especially at these discounted prices. But the fact that it’s so, and we are here, suggests a potential problem. If it is going to move higher it had better get started pronto. The dollar index is hovering above some nice chart points. Ordinarily, I’d be drawing the horizontal lines to demonstrate it. But frankly, they look stale to me. And perhaps even random given the facts now versus those of the early days of the previous administration. 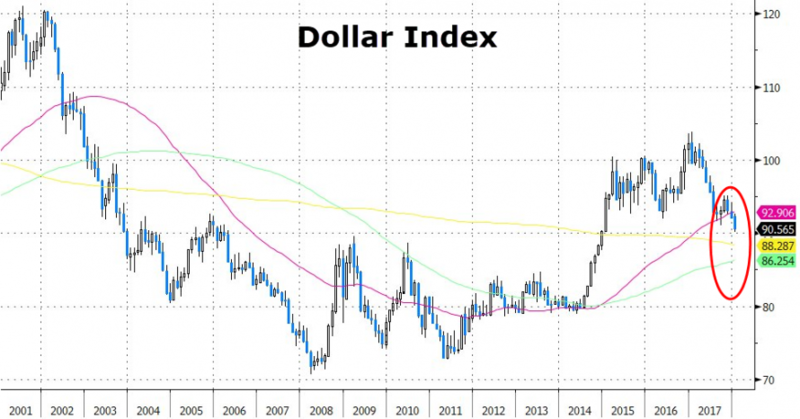 Of more immediate interest is how the dollar is trying to leak through some pretty decent long-term moving averages. I’m talking monthly and quarterly, not the last week and a half. And yes, I fully realize that it’s early days and mood swings can be extreme at this time of year. The most constructive thing I can say from a technical point of view is that the momentum of the latest selloff seems to have waned. On the other hand, the dead cat bounces have yet to inspire. Put rate hikes, growth rates and the like aside for the moment. Let’s also not cite the twin deficits. This looks like the far more worrisome and potentially long-lasting effects of global reserves being consciously built up and allocated in a more widespread fashion. It represents a crisis of confidence about the global reserve currency and country. Spend some time overseas and you won’t be surprised. It certainly doesn’t look or feel like some traders are getting too far out over their skis. I can’t help but idly speculate whether the global reserve build up is a good thing because it increases the safety net, or problematic because central bankers worry that they’ll need it. 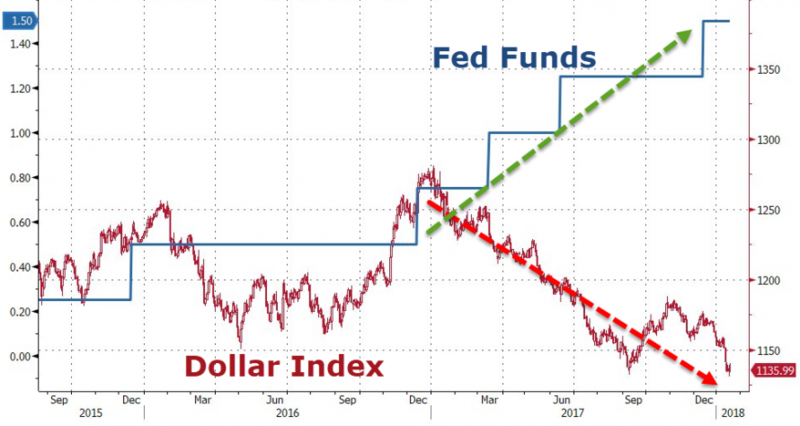 In any case, how this plays out will have a much more important effect on the dollar’s prospects than whether the Fed does two or three more hikes. The irony of it all, is we are all waiting for pushback on dollar weakness. Traders can’t wait to hear from ECB President Mario Draghi next week. Yet if it’s official purchases of non-dollar currencies contributing to what is going on, their protests will wring a bit hollow. Sort of like the irrational exuberance warnings about asset prices from monetary policy-makers who continue to buy right on schedule. We’ll see where this goes but we need to make sure the debate centers on the actual drivers at hand.